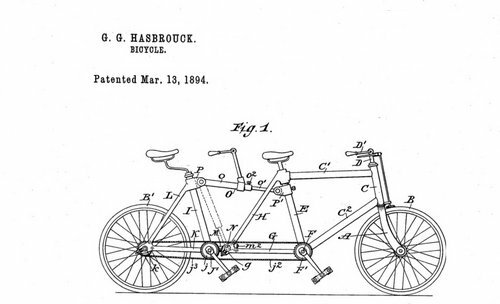 I don't know if this is the first, but it is certainly an early tandem bike. This is a conversion kit, for making a regular bike into a tandem. This kit was patented in 1894. 1884 Daily News 19 Sept. 3/3 Cycling on a ‘tandem’ in Norway. When our tandem was placed upon the pier, we were surrounded by an eager crowd. 1888 Encycl. Brit. XXIII. 560/1 For nearly every make of single tricycle there is a corresponding tandem.